As OnMedia/DISH/DirecTV present the action in the four weekly classes, it will be Ozarks Food Harvest Night. Fans bringing four non-perishable food items to the front gate will get to see the racing action for free. The Big O Tires Street Stocks will be the featured class, running a special 25-lap, $750-to-win main event. Last year, fans donated 7,813 pounds of food at the event, providing 6,510 meals to people in need according to Sara Roelke, communications coordinator for Ozarks Food Harvest. Since the event at Lucas Oil Speedway started in 2008, more than 54,000 pounds of non-perishable food has been collected to provide more than 45,000 meals. Ozarks Food Harvest serves approximately 30,000 individuals per week, distributing more than 17 million meals annually through its network of 270 organizations and programs in 28 counties. Hickory County C.A.R.E.S. Food Pantry in Wheatland benefits from weekly deliveries by Ozarks Food Harvest. The pantry will receive a portion of the donations from Saturday’s food drive. More information about The Food Bank can be found at ozarksfoodharvest.org. In the spirit of giving, last Saturday on the Lucas Oil Speedway midway the American Red Cross Bloodmobile collected 11 units of blood. Those units can help as many as 33 patients in need. On the race track, championship chases will resume in all four classes. David Hendrix of Waynesville leads the Big O Tires Street Stocks in points with Aaron Marrant of Richmond in front of the Warsaw Auto Marine & RV ULMA Late Models, Springfield’s JC Morton pacing the Ozark Golf Cars USRA B-Mods and Darron Fuqua of Mayetta, Kansas topping Pitts Homes USRA Modifieds. Drivers entering this week’s action will receive 50 free admission tickets for the Season Championship races on Aug. 25. Gates will open at 4 p.m. Saturday with hot laps at 6:30 and opening ceremonies at 7. 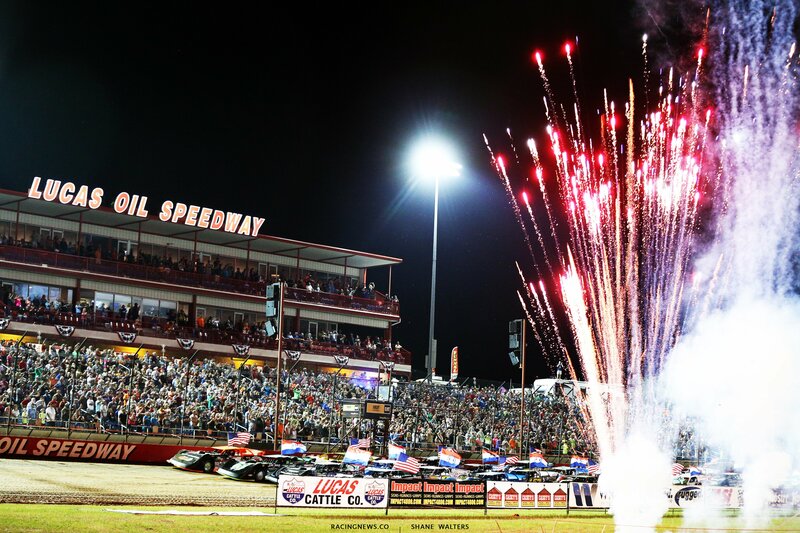 For ticket information on all events at Lucas Oil Speedway in 2018, contact admission director Nichole McMillan at (417) 282-5984 or by email at [email protected] Fans also can go online to purchase tickets for any event on the 2018 schedule.